Online services wholesaler Distribute.IT has reportedly suffered a malicious attack that has left it scrambling to reconfigure its network and servers. Resellers and end users on the Whirlpool broadband forums first reported the hack at 5.50pm on Saturday 11 June. The company - best known as a domain name registrar - said in a post to its Twitter account that it had been the victim of a "very deliberate, coordinated & malicious attack". It said that domain registry and some web hosting services it provided would "remain offline until further notice". 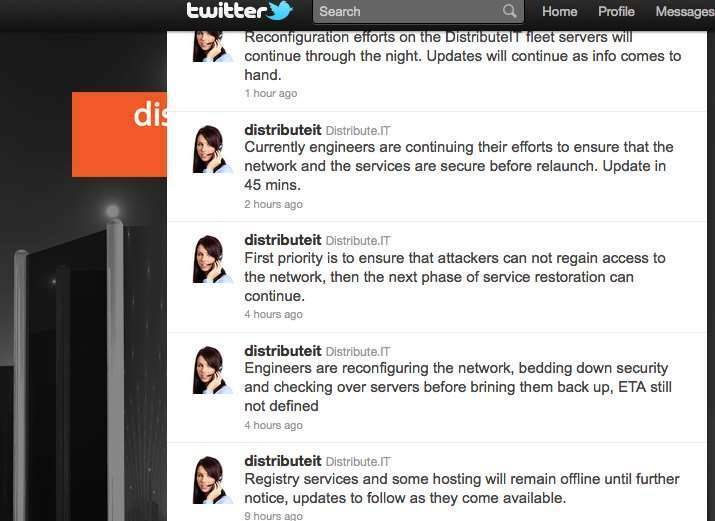 "[The] first priority is to ensure that [the] attackers can not regain access to the network," the company tweeted. "Engineers are reconfiguring the network, bedding down security and checking over services before brining [sic] them back up." The company said that "reconfiguration efforts" on its servers continued "throughout [Sunday] night". It reported on Monday morning (13 June) that engineers had "started running malicious file system tools across known exploited servers while rebuilding header information where corruption to headers has been found." "We are unable to advise of any data loss at this stage but expect to know more today," the company said Monday. The company reported restoration of some services on Tuesday (14 June). "Staff are working through servers one-by-one to check for any problems, and then restoring," the company said in a brief statement. "Many of the colocation servers are reconnected, with staff now mostly focusing on virtual dedicated, and shared servers presently." The company did not shed any light on how the attackers had gained entry to its systems. It said that the attack would be reported to "authorities" although it did not disclose whether that was state or federal police, or to domain regulator auDA. It appeared the hackers defaced Distribute.IT's homepage, which was taken offline about two hours later. Reseller frustration boiled over on microblogging service Twitter. BYO Web reported losing six of its customers. Xyzed_Net reported similar customer losses and doubled its calls for an ETA after "two days" of downtime. All sought more information from Distribute.IT other than the company's brief Twitter updates. "Come on guys, more info please. We all have business to run as well. How you handle these difficult times says a lot," web development firm Ripe Solutions said in a tweet. The website of Australian Macworld magazine was also affected by the ongoing outage.